The day started with a stunning location we were camping in. The sky was covered in clouds but it was painted in a beautiful colors of sunrise. Yesterday we fall asleep by the sound of the ocean and monotone songs of zucades. That was very calming. We slept very well, it was a very quiet night, you can even say hot because there was no wind. The day promised to be cloudy and cooler than the rest of the days which we were glad to see cause walking in the sun gets quite tiring. 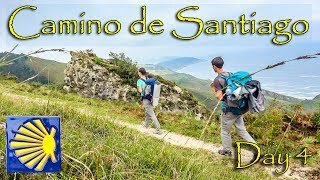 So we had our breakfast and left to search for the official Camino route that was going higher away from the oceanside. And this 5 km path that we took to it probably was the most scenic so far. It was definetely challenging but we got to see the huge rocks with the pores, abrupt cliffs, mountain shelter with the swings and even condor bird which we didn't even know was living there. So we enjoyed this part throughly and decided that we would take these opportunities to get away from the official route when we can. We got out on the car road and instead if going on it we took the GR route that was going parallel. So we didn't really lose anything. We were getting close to the Pasaia city and knew that we had to take the boat to cross the channel port. So we did and it turned out to be no more than 40 sec. trip. We didn't even have time to realize what it was. The village itself looked a really old port city with a particular architecture very different from what you would see on Mediterranean Sea. Then we took the opposite direction from the Camino indicators and got straight into the city San Sebastian because we already lost quite a bit of time in the mountains and we still had lots of things to do. It was quite a long walk and we regret we didn't took the bus to our needed destination. In the city all the churches were closed for some reason so we didn't put a stamp in our pilgrim credential hoping that in the other smaller villages on the way we'll compensate that. Although we didn't check the tourist office probably they do that as well. Also we bought some food as usual to have a snack and for the dinner-breakfast preparation. The last stretch of the day was 8.5 kms and they were probably the hardest ones cause we were already tired from the city, it's noisiness and crowdness and extremely hot weather but we had to gather all the powers left and do it to our camping spot. The city San Sebastian turned out to be a very big city and even reminded us a bit the other Spanish city Barcelona where we had lived for 3 years before. But of course it has its own speciality and feel. It was almost impossible but we managed to get to our camping site and all we wanted was to take a shower and sleep as much as we could. And so we did.